There has been a distilled media narrative involving partisan politics when mentioning him. Lost in all the noise is his incredible humanitarian legacy. 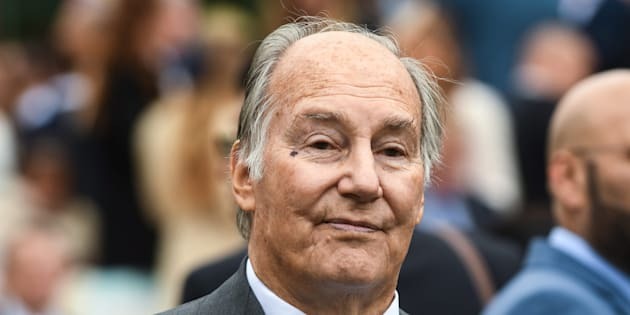 Karim Aga Khan IV attends Qatar Prix de l'Arc de Triomphe at Hippodrome of Chantilly, north of Paris, France, on Oct. 1, 2017. The Global Center for Pluralism — a joint initiative by the government of Canada and the Aga Khan — hosted its inaugural awards gala in Ottawa on Wednesday. The Aga Khan presided over the ceremonies along with former prime minister Joe Clark and Chief Justice Beverley McLachlin. This event underscored the Aga Khan's lifelong belief that "pluralism is no longer simply an asset or a prerequisite for progress and development, it is vital to our existence." Recently, there has been a distilled Canadian media narrative involving partisan politics when mentioning the Aga Khan. Lost in all the noise is his incredible humanitarian legacy, which is especially noteworthy given the occasion of his Diamond Jubilee. For the past 60 years, the Aga Khan has been a tireless champion of peace, diversity and pluralism. When we take into account the immense contributions of his international work, it is clear that he is one of the most deserving individuals of the Nobel Peace Prize. The Aga Khan became the spiritual leader of the Ismailis on July 11, 1957. At that time, he was an undergraduate at Harvard and was chosen to succeed his grandfather as the 49th hereditary Imam of the Ismailis — an office with a history spanning more than 1400 years. Ever since the mantle of leadership was passed to him, he has provided secular and spiritual guidance to his followers, in addition to working towards the uplift of peoples around the world regardless of ethnicity, creed or religion. Canada's Prime Minister Justin Trudeau (L) meets with the Aga Khan, spiritual leader of Ismaili Muslims, in Trudeau's office on Parliament Hill in Ottawa, May 17, 2016. The Aga Khan's legacy of humanitarian service is deeply personal for me and my wife. As Ismailis, both our families were direct beneficiaries of the Aga Khan's relationship with Canada and former prime minister Pierre Trudeau. In 1972, Idi Amin, then-president of Uganda, declared a 90-day ultimatum for the expulsion of Asians from Uganda, including Ismailis. It was the Aga Khan who was able to call on his friend to ensure the safeguard of thousands of refugees, many of whom settled in Canada. The Aga Khan has also played a vital role in other conflict areas including Afghanistan and Syria. Since 2002, through the Aga Khan Development Network (AKDN) and its partners, nearly US$750 million has been contributed to the reconstruction of Afghanistan. This investment has helped to produce large-scale rural development, education, finance and technology services including Roshan, the largest telecommunications service in the country. The Aga Khan has also been an important counterweight to extremism in the region, debunking the myth that moderate Muslims need to do more. "Malala Believes In Canada. Let's Prove Her Right"
In Syria, the Aga Khan has been extremely active in an attempt to help broker peace during a time of civil unrest. This has included meeting with important stakeholders, including Russian Foreign Minister Sergey Lavrov, and former U.S. Secretary of State John Kerry, who conveyed that he was "deeply appreciative for our friendship and for your efforts for peace around the world." Former Governor General Adrienne Clarkson best described the influence of the Aga Khan when suggesting that he is "perhaps the only person in the world to whom everyone listens." He has spent his entire life in the service of humanity, and particularly, for those most in need. a keen interest in medical development efforts around the world. Along with institutions including the World Health Organization and the Bill & Melinda Gates Foundation, Aga Khan Health Services (AKHS) — an agency of the AKDN — is arguably one of the world's most impactful medical organizations. The numbers speak for themselves. The AKHS provides medical care for 1.8 million patients annually across 200 health centres — including 14 hospitals — in East Africa, Central and South Asia. It established the first comprehensive heart and cancer centre in sub-Saharan Africa while running the only hospital in the region to be accredited by the Joint Commission International. The network is also responsible for the creation of the first university nursing program in Pakistan that has trained more than 6,000 nurses. As a third-year medical student, I spent a month at the Aga Khan University Hospital in Nairobi. While impressed by the incredibly modern medical campus, it was the institution's culture of ambition, commitment to best practices and its focus on excellence that really stood out. Critically, all of this has been possible because of the Aga Khan's vision for a better world. He has spent his entire life in the service of humanity, and particularly, for those most in need. His promotion of the values of inclusion, peace, civil society and human dignity were recognized when the Harper government made the Aga Khan an honorary Canadian citizen. As the former prime minister described, "His Highness's lifelong advocacy for humanitarianism, pluralism and tolerance has gone far beyond words." Canada has been an incredible supporter of the Aga Khan's global work, including partnerships in the areas of early childhood education, health care and disaster relief. This is a humanitarian legacy that Canada has played a significant role in creating, and one that it should be immensely proud of. On the auspicious occasion of the Aga Khan's Diamond Jubilee, what better way to commemorate this amazing milestone than by nominating him for the richly deserved Nobel Peace Prize. Valuing the importance of harmony, above all else, the Aga Khan remarked: "Any leader of any global community hopes and prays for one thing — peace."